The famous Kerala Lake Temple’s Crocodile Babia Died and Passed Away to Heavens Today! 1. In Padmanabhaswamy temple of Trivandrum this 130-year-old crocodile living only on lord’s Prasad passed away to heavens today. A picture message doing rounds on social media sites claims to show that the famous Kerala Lake Temple’s Crocodile Babia Died Today and Passed Away to Heavens. Babia is the well known Vegetarian Crocodile believed to be guarding the Ananthapuram Mahavishnu Lake Temple in Trivandrum, Kerala. It is a fact, the picture accompanying the message shows a group of people alongside a dead crocodile, but it is not Babia. No, the vegetarian crocodile in Mahavishnu Lake Temple of Kerala did not die; it is alive as of this writing. There are no such reports about death of the famous Crocodile. What you see in the picture is in fact another crocodile in Chhattisgarh called Gangaram, which died in early Jan. 2019. Messages about its death also appeared on social media. In the morning of 8th Jan. 2019, residents of Bawamohatra gathered near the community pond and started crying after they saw their beloved crocodile, called Gangaram, had died. Bawamohatra is a village in Bemetra district of Chhattisgarh, India. Villagers said Gangaram, the crocodile was a friendly creature that would eat even rice and dal served by the villagers and kids. They also said the villager kids would swim around the crocodile and it never harmed or attacked anyone. The villagers in fact considered Gangaram as a divine creature which protected and guarded the village. The reptile was over three-meter-long, weighed about 250 kilograms and about 130 years old, according to an estimate of a forest department official. After the death of Crocodile Gangaram, a post-mortem was conducted in presence of the villagers, which found the old creature died of natural causes. Later, the body was handed over to the villagers, who carried it on a tractor decorated with flowers and garlands. The villagers mourned the death of their beloved crocodile by not cooking food and performing the death rituals for it. About 500 people attended the last rites of Crocodile Gangaram and buried it at the banks of the pond where it used to live. The village sarpanch said they are also planning to build a statue near the pond in memory of their Crocodile Gangaram. Below is a video report showing few glimpses from the last rites of the crocodile in Chhattisgarh. 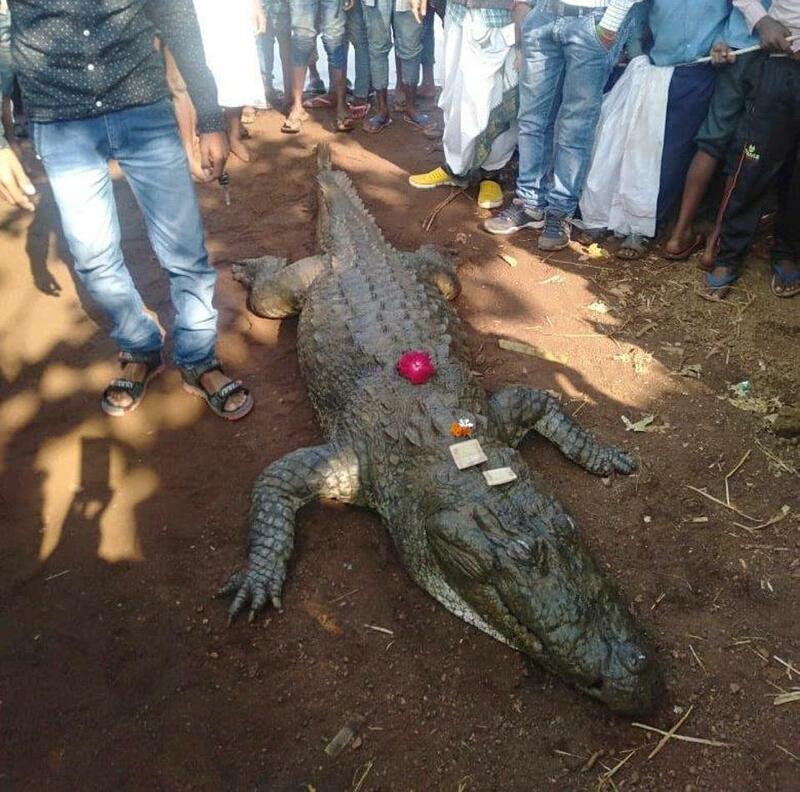 So, the picture messages claiming to show Kerala Lake Temple’s Crocodile Babia Died are hoaxes. 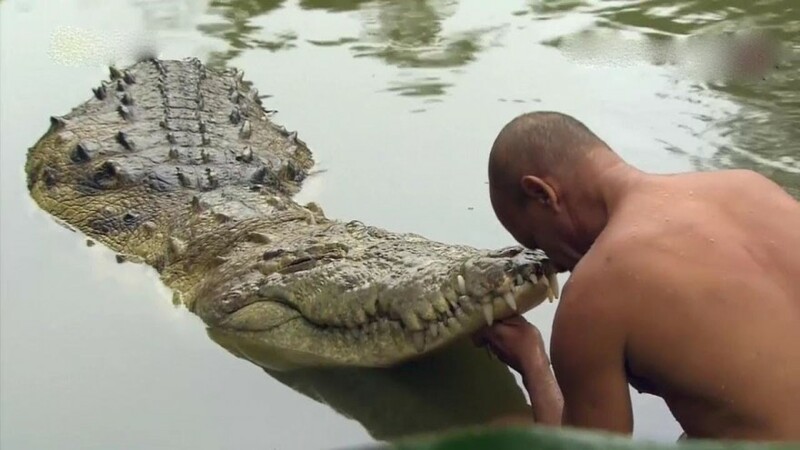 Nonetheless, the death incident of crocodile Gangaram is undoubtedly a good example of human-animal bonds which makes us emotional.